There’s growing concern within the baseball community about the health of the MLB as an organization, and the game overall. Since the mid-2000s, attendance and television ratings have been dropping consistently. According to Baseball Reference, in the past 20 years attendance per game across the entire MLB peaked in 2007 at 32,696 per game. In the ten years since, there has been a steady decline in attendance per game all the way down to 29,908 per game in 2017. That is a decrease of just about 8.5 percent. I’m not including 2018 numbers in this analysis as we are still in season and the spring typically draws a smaller crowd. The commissioner’s office often talks about game length as being a driving factor in this decline, but I believe that is an oversimplification of the trend, and there are bigger factors in play. Figure one, which compares attendance and game length, raises some questions about the validity of the League’s primary argument that game length is affecting financial success of the league. As you can see, these two lines don’t seem to be correlated at all besides a very faint trend. It’s also interesting to note that the total range in game lengths in this 20-year span is only 19 minutes, with the average length per 9 innings being 2 hours and 53 minutes. 13 of the 20 years fall within 5 minutes of the average game length. In other words, we are not seeing egregious volatility in game length in the MLB. At the very least, it’s a stretch to assume game length is the sole cause of the downward trend in attendance. I want to be clear in this post: I am not against making minor changes in baseball to speed up the game. I think in 2017 we were at a point in game length that was not sustainable over the long term (3 hours and 5 minutes/9 innings). The corresponding rule changes made for 2018 seem to have had a slight effect. So far in 2018, the game length per 9 innings is down to 2:59. Something that does drives game time up considerably is pitches per plate appearance, as you can see below in Figure 2. I heard suggestions such as lowering the mound once again to reduce the pitcher’s advantage, thus creating less strikeouts and reducing pitcher per plate appearance. In theory, this could work. When the MLB lowered the mound in 1969, run production increased for two years. However, in 1971 & 1972, it suddenly declined, leading to the implementation of the DH in the American League in 1973. If you went to lowering the mound in 2019, you may have a shorter game due to less strikeouts, but run production could spike so much that you would have to make another adjustment, or worse, the games actually got longer due to more runs. Not to mention changing the record books. 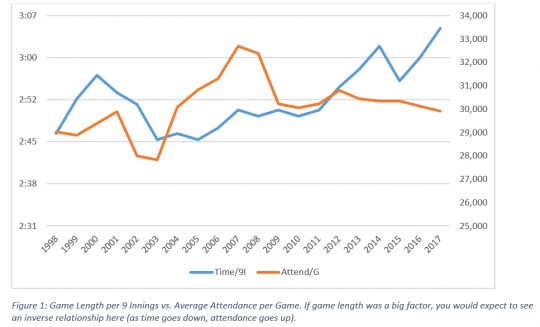 So, what actions can the MLB take to help raise attendance levels? The reason people aren’t attending games is because it’s too damn expensive. Since 2006, the average MLB ticket price has gone from $22.21 to $32.44, per Statista.com. That is an increase of 46% over just 12 years. This is an extreme burden on families, and this increase is seriously outpacing inflation or any significant change in the economic environment. ValuePenguin.com had a great article that was written in 2016 about the true cost of attending a Major League Baseball game. They found that when you consider the median household incomes in MLB cities, and account for all associated costs with attending a game (tickets, food, drinks, transportation), on average a fan must work 4.3 hours to offset the cost of a game. You won’t attend many games if you’re being hit with that every time. What bothers me about this conversation is that it’s largely led by the commissioner’s office. The commissioner wants financial success for the owners and teams. I don’t consider myself a baseball purist, but I don’t want to see major changes happen to the game in hopes of shortening game length, when a simple solution of lowering ticket prices could increase attendance just the same. All the changes being suggested will have a marginal effect on the time it takes to play a baseball game. As we saw in Figure 1, in the past 20 years, the average game length has only varied by 19 minutes. If you want something drastic to return to the 2:30 games of the mid-20th century, you would have to reduce the count to 2 strikes and 3 balls, or something even more drastic. So, let’s start a conversation on the affordability of the games, get more people (especially kids and families) into parks around the country, and get baseball back on track. Long term, it’s in the owners’ and the League’s best interest. I think you're right but missing one thing - the game has become much more boring. Fewer balls in play, more strikeouts, less action. I used to go 5-8 times a year. Now, two games a year is a lot. By the time you drive there, watch the game,and drive home, you have to spend 5 to 6 hours. There used to be at least and hour or two of action in that 5 to 6 hours with lots of chances to score, interesting plays and some excitement. Now, there's 30 minutes of action if you're lucky and all the scoring is on home runs or in one or two innings. It just isn't as much fun. 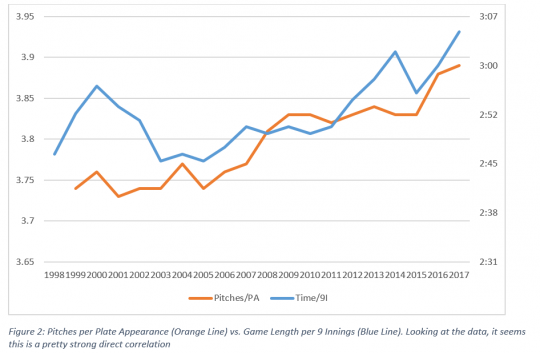 The advanced analytics that have led teams to limit pitchers' exposure in games and employ stifling defensive shifts have, in turn, led to batters increasing launch angles in attempts to to maximize their declining contact. While these may be effective measures / counter measures to optimize for wins, they do not optimize for entertainment value. Quite the opposite. At-bats become bloated with more pitches. Fewer at-bats result in the ball being put in play, and so on and so on. It's time for there to be some measures to save baseball from itself. Why not a rule that two infield defenders have to be stationed on each side of 2B at all times? Football mandates 7 men on the line of scrimmage and basketball prohibits defenders camping inside the lane. Why should baseball NOT have positioning rules to maintain similar balances between offense and defense in THEIR games? Baseball has also demonstrated that the ever increasing number of pitchers on a staff has to be limited to something like 10. That would cut down the number of pitching moves managers could make, would force pitchers to pitch to more batters, (could potentially lessen arm injuries as pitchers pace themselves once more), would lead to fewer pitches per at-bat, would remove the worst pitchers in the league, would add more bench batters to negate righty-lefty pitching changes, ultimately lead to more balls put in play - all good things. Restrictions would need to be put in place to keep teams from running an underground railroad of fresh pitchers back and forth to the minors - exposing a player to waivers if he's had more than X number of call-ups and demotions in a year would seem to solve that. These are both simple changes that don't alter the fundamentals of the game a bit. Just the aesthetics.I get that for the 30 GMs and Managers an unwatchable win is a preferred outcome to an entertaining loss - but the capital they need to operate flows through the fans, and if the fans go way - what was the point? There was a fantastic article in Baseball Prospectus detailing how the shift may be going away for the majority of hitters in the league due to the high number of walks thrown in front of it (Walking Away From The Shift). If that happens, why shouldn't teams be able to shift against just the Joey Gallo types of the world. As a baseball enthusiast I enjoy the strategy of it. Baseball has also demonstrated that the ever increasing number of pitchers on a staff has to be limited to something like 10. That would cut down the number of pitching moves managers could make, would force pitchers to pitch to more batters, (could potentially lessen arm injuries as pitchers pace themselves once more), would lead to fewer pitches per at-bat, would remove the worst pitchers in the league, would add more bench batters to negate righty-lefty pitching changes, ultimately lead to more balls put in play - all good things. My response to this is the unintended consequences of moves like this could be immense. First, pitchers would get hurt more. If you say they would pace themselves and throw softer, hitters would swing for the fences even more. Thus resulting in more Home Runs and less balls in play, which goes against your main point. I think there's moves to be made for sure. I just think lowering ticket prices is one that should be priority #1. The MLB also does a terrible job at promoting their superstars. Mike Trout is the best hitter (and overall better player) since Barry Bonds, yet we almost never hear from him. These two things should be improved first, then we can talk about changing the fabric of the game. Appreciate your comments! There used to be at least and hour or two of action in that 5 to 6 hours with lots of chances to score, interesting plays and some excitement. This is a false narrative I've seen pushed by people who claim baseball has lost action because of shifts, home runs, etc. In 2010, there was an average of 18 minutes of "action" (pitches being thrown, balls in play, runners running, etc). In the 1957 World Series, there was 13 total minutes of the same type of action. This notion that there is less action is not entirely accurate. There has been more time stretched between pitches and between innings (commercials) but the time of moving parts on the field has not. I agree with Miles' conclusion that there are probably more families staying home than previously and that has some affect on the attendance. As a family of five, we now go to one game each year as a group. Likewise, with the shift in action happening between the pitcher and the batter, I find watching the game more enjoyable at home where I can see all of that activity. I would assume more people choose to watch at their homes as well (local ratings have been doing just fine). What bothers me about this conversation is that it’s largely led by the commissioner’s office. The commissioner wants financial success for the owners and teams. Right. Of course MLB should be concerned about a dip in attendance, but they shouldn't assume they know what's causing it. I can only speak for myself. Above all else, it's simply cheaper and more convenient to watch the game at home, but having even one kid has dramatically impacted the number of games I go to. In the few years prior to having a baby I had a 20-game season ticket package. I've only gone to one game so far this year, but in no way is that a reflection on my interest/enjoyment of today's game. if they really want to shorten the game time they should institute an electronic strike zone . I think it would cause the hitters to be more aggressive instead of just sitting back waiting for a pitch to drive. from the many games I have watched the corners are rarely called on a consistent basis. quicker at bats mean faster moving games which would hold the interest of more people IMHO. Consequences of reducing the pitching staffs would not be immense or mysterious since 95% of baseball history incorporated this. The true unintended consequences are what's occurring in today's game. Teams will mange the reduction in pitching staff size to the least detriment possible so will either impact the appearances with the smallest innings footprints or the least game leverage consequence. (one-hitter-only relief appearances; 3-run-lead save opportunities) The 3+ relievers that it currently takes to complete a game would taper back to something like 2.5 with the added innings burden most likely being an increase in the number of 80 IP middle relievers. Also, the injury increase worry can be addressed by just comparing the 90s and 2000s - when there actually were fewer pitchers used per game - to today. Are less pitchers losing time to the DL today than they were then? Are Tommy John surgeries any less frequent? As far as affordability, I beg to differ. You could get 13 April home games this season for $49. In 2017, they gave you all April and May home games (except the home opener) for $99. Yeah, I get they are standing room only. Still, you should be able to find a seat. My family and I sit in the family section for an April day game each year - it's usually a value or extra value game and we get the ticket,hot dog, and soda for $10. There are affordable options if you don't insist on going to a weekend game in the summertime. When I was my son's age I would beg and plead my dad to take us to the ballpark. My son has his nose buried in a tablet all day and night with no desire to go to a Twins game. Some of the dip in attendance is the shorter attention spans found in today's world. I say that watching on tv pales in comparison to being at the ballpark. Old school. Heck, even the NFL has seen a dip in tv viewers and in attendance.